We expect movies to be action packed, dangerous, and violent, but some films are just so hell bent on destruction, they seem to take it out on their actors. While filming The Passion of the Christ, Jim Caviezel was injured so many times you would think that God himself was trying to halt production of the film. Caviezel suffered cuts, scrapes, backaches, caught pneumonia as well as a lung infection, and dislocated his shoulder carrying the cross. Additionally, director Mel Gibson wanted the film to be as realistic as possible so he ordered two actors to whip Caviezel “overhand as if throwing a baseball,” which resulted in a 14-inch gash on the actor’s back. While performing a stunt for Syriana, George Clooney injured his spine so badly he started blowing spinal fluid out of his nose. Clooney was hospitalized and his injury was so serious that he contemplated suicide telling Rolling Stone, “I was at a point where I thought, I can’t exist like this. I can’t actually live.’ I was lying in a hospital bed with an IV in my arm, unable to move, having these headaches where it feels like you’re having a stroke, and for a short three-week period, I started to think, ‘I may have to do something drastic about this.’ You start to think in terms of, you don’t want to leave a mess, so go in the garage, go in the car, start the engine. It seems like the nicest way to do it, but I never thought I’d get there. See, I was in a place where I was trying to figure out how to survive.” Clooney later underwent a successful surgery to reduce his pain. While filming the sinking of the ship, several extras experienced injuries ranging from a broken ankle to cracked ribs, a fractured cheekbone, and a ruptured spleen. While filming the climax of the movie, Kate Winslet contracted pneumonia and was worried she was going to drown. But the worst was yet to come. During an after party, 80 members of the cast and crew, including director James Cameron, were hospitalized after someone spiked the lobster chowder with PCP. Jackie Chan’s career almost ended while filming a stunt for the movie Armour of God. Chan was supposed to jump up and grab tree branch, but lost his grip and fell 15 feet, smashing his head on a rock and causing blood to pour out of his ears. He was rushed to the hospital where he underwent emergency brain surgery and the actor has a plastic plate in his head to cover the permanent hole in his skull. 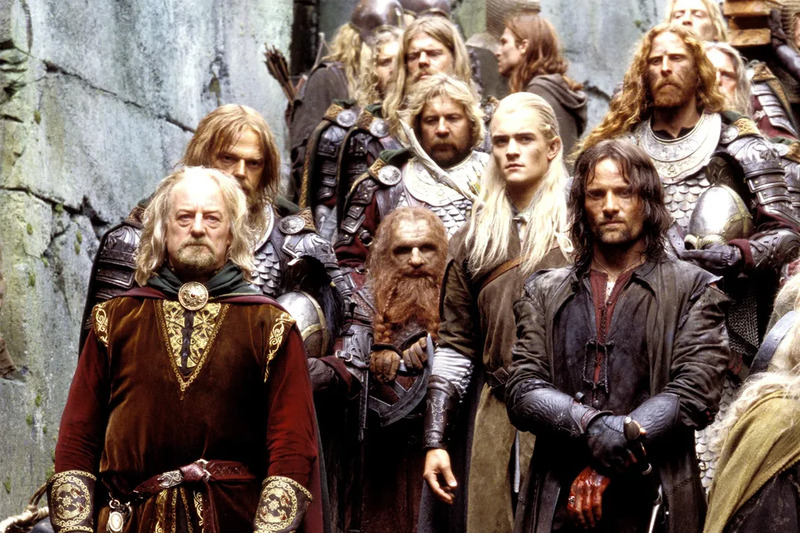 During the filming of The Lord of the Rings trilogy, the whole fellowship experienced a range of injuries. Sean Astin stepped on a piece of glass. Viggo Mortensen broke his toes. Orlando Bloom cracked a rib after he fell off his horse. John Rhys-Davies, not be outdone by Legolas, suffered a broken back, a broken arm, and was at one point scalped by a wall. It wasn’t just humans who were endangered either. Animal handlers involved with filming of The Hobbit trilogy believe that as many as 27 animals were killed during the production of the films. The animals were kept at a farm riddled with “bluffs, sinkholes and other ‘death traps.’” One horse cut open its leg on a fence, several chickens were mauled to death by dogs, and goats and sheep regularly died after contracting worm or falling into sinkholes. And if that’s not sad enough for you, the first animal to be euthanized on set was a miniature horse named Rainbow. For more behind the scenes info, check out 25 ‘Titanic’ Facts You Never Knew or 21 Wonderful Facts About ‘The Wizard of Oz’.